Market surveys have indicated that there is a strong trend among specifying engineers to modify existing 18 gauge sizing to 16 gauge material when appropriate and the installation permits. Depth of product selection sets this line apart. 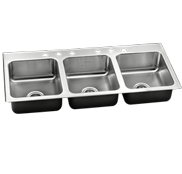 Industrial Grade Stainless Armor Sinks seamlessly die drawn drop-in and under mount sink series. Available in over 270 stock models spanning the full range of market applications. 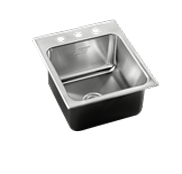 Armor models are now available with the Integra Drain option! 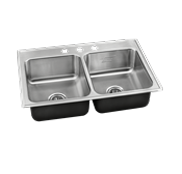 The need for heavy duty industrial grade stainless steel drop-in and undermount sink products that are corrosion resistant, impact resistant, heat and fire resistant is apparent in high-use environments. Installations that are prone to vandalism and all unsecured areas of any facility are also ideal for any of the "Armor Series" listed below. As with all of our other models, online product support for the "Stainless Armor" series includes spec sheets and product detail screens. Available files include PDF, AutoCAD and BIM file formats.